I'm thinking of building a tele with the neck I got from Eric. Since my Mex Tele already covers my classic Tele bases (with Lollar Vintage T's and a Wilkinson ashtray bridge), I'm thinking of something different. I was messing around with USA Guitar's app and here's the configuration that speaks to me. It's kinda old school meets new. I love the looks of the 52 RI so I combined it with a hotter Tele bridge pup, a Strat middle, and a P90 neck. I'll likely order the body and then build 'er up. Shell pink with the mint guard would be beyond awesome! That thought crossed my mind. I did model one up but, again, this one 'spoke to me'. Edited to add: The shell pink looked better with a rosewood fretboard. +1 Looks pretty cool, and very versatile. 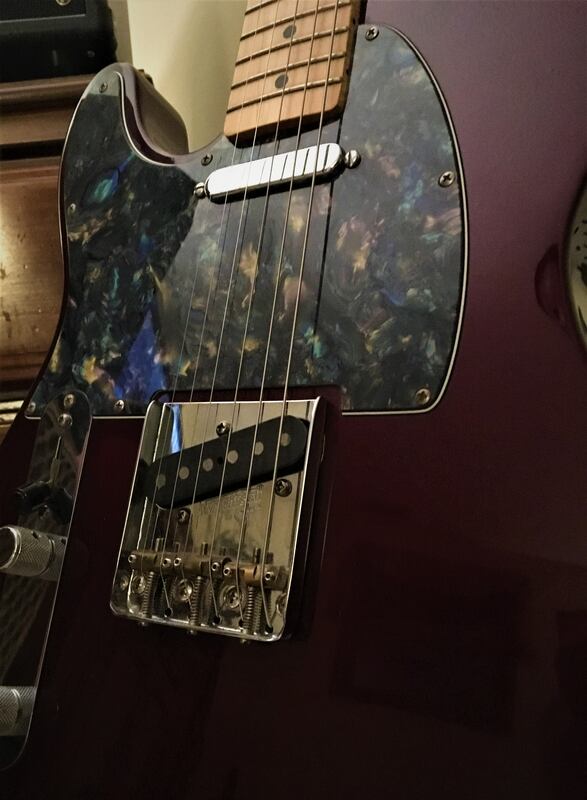 Mike, I have the burgundy/maroon base covered with my other Tele. FWIW, I showed the pink to the wife and she said, "Who are you? A Powerpuff Girl? It's not you." lol! I’ve been toying with the idea of a burgundy guitar with cream plastics. I like the concept, but Daphne Blue is the color for me. You want something different? Stick a right-handed bridge on that. It will give you mids-forward, growlier highs from the bridge pickup than you get from a typical Tele. Like that last one I did. My OCD is kicking in trying to flip that pup with my eyes. lol! I’ve got it hung next to a standard Configured Tele and it looks like, between the two of them, they are smiling.